“The Alchemy of Light” makes projection mapping more than a sculptural, light-painting illusion. It allows the digital motion image to interact with the performer. And the human performer is a big part of what makes this work. The project comes from performance artist by the name of “a dandypunk” (Joel Sebastian), and the Cirque du Soleil-veteran performer makes his movement as dazzling as the projected imagery. The work is in turns fanciful and poignant, and the dance of imagery and the dance of man blur into one another in rapid-fire succession. As with the practice of magician Marco Tempest, the effect requires practiced choreography, not just technology, a ballet of illusion. 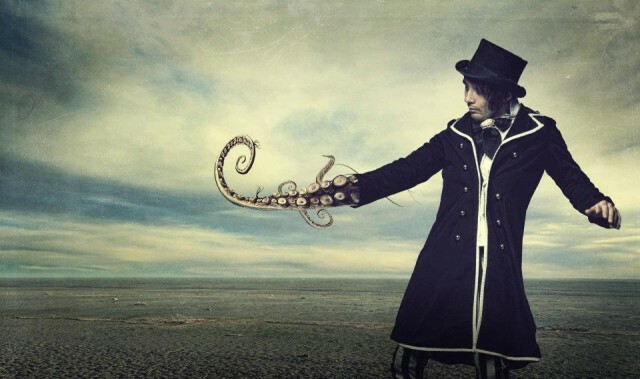 A dandypunk – the human here matters as much as the projected imagery. Photo courtesy the artist. Via Shocklee.com, who are always tuned into the new. Secret Show – Underground multimedia performance art by Cirque du Soleil artists from a dandypunk on Vimeo.